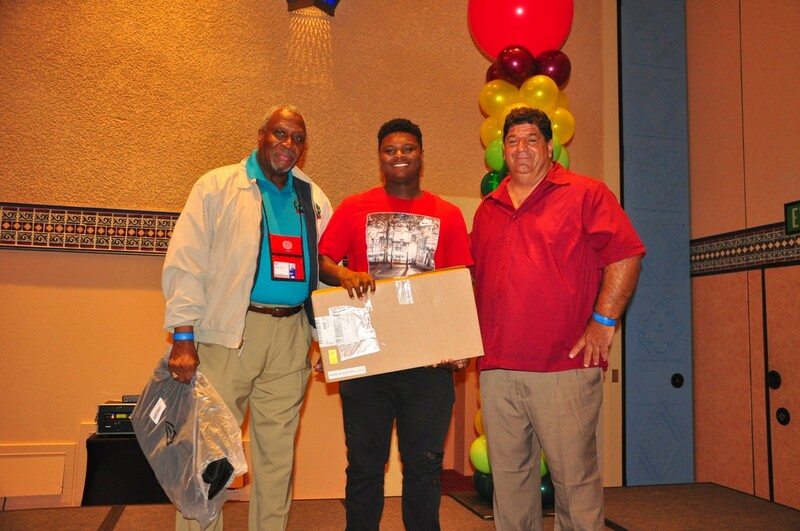 Two hundred thirty Police Athletic League (PAL) kids and their adult leaders attended the State of Florida Association of Police Athletic/Activities Leagues (SFAPAL) Youth Directors' Conference (YDC) held from June 30th through July 3, 2016, at Disney's Coronado Springs, a Southwestern-styled convention/resort, described on the park shuttle bus as "reminiscent of colonial Spain and ancient Mexico." Without PAL, some kids at the conference would never have the opportunity for travel or to stay in such nice surroundings. PAL shows them a new world. 3rd of the YDC was a sea of emotional colors!!! The Youth Directors Conference (YDC) is the highlight of the year for many PAL youngsters. It is offered each year to PAL kids who belong to Youth Directors Councils sponsored by their local PAL chapters. These programs, for young people ages ten to eighteen, promote leadership skills and encourage the members to work within their communities to effect positive change. 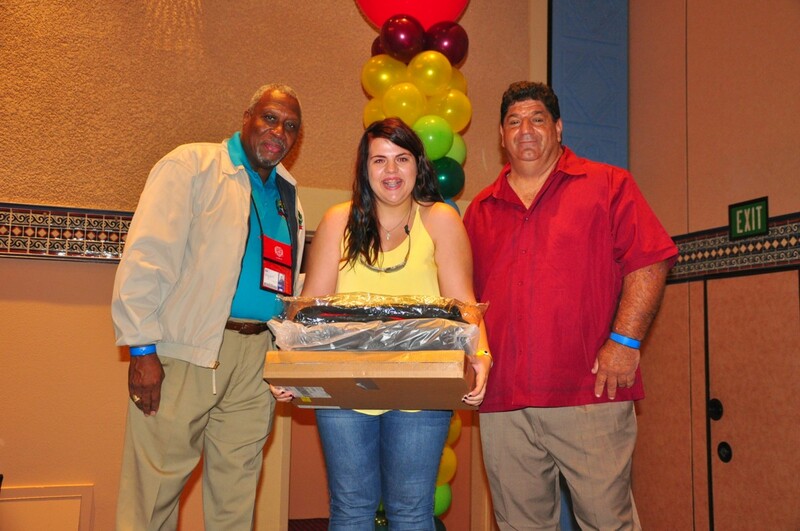 If the youth do the required community service and meet the other guidelines, such as attending their local and regional YDC meetings, then the annual conference, the meals, the lodging, and the Disney theme park passes are free for four youth directors and two adults from each PAL chapter, compliments of SFAPAL. Many PAL chapters pay from their own funds so that additional PAL kids and adults can attend. 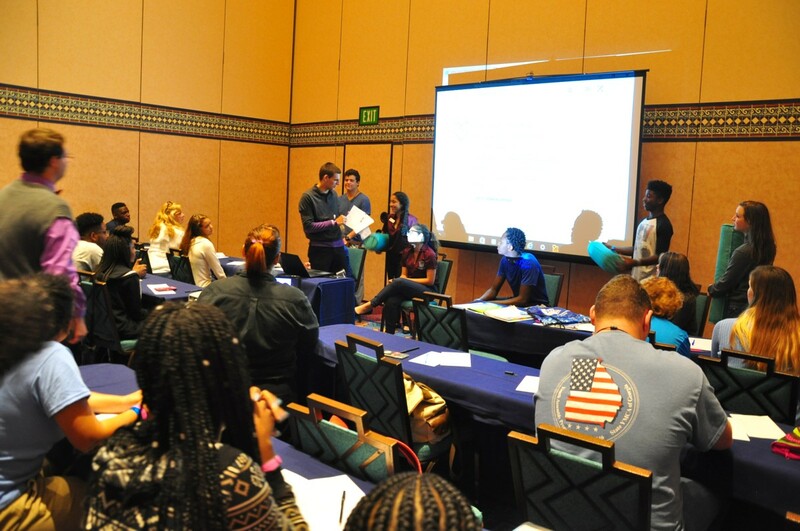 The PAL kids attending represented sixteen PAL chapters, mostly from Florida, with one chapter from The conference featured dynamic and informative break-out sessions and lots of fun activities encouraging interaction among the attendees. New friendships were formed and old friendships were renewed with people from other PAL chapters. After the workshops were finished at the close of each conference day, usually in the early afternoon, there was plenty of time to explore the Disney theme parks. This conference is unique in that it is a conference for kids, planned by kids, and run by kids. The kids responsible for engineering this are members of the Youth Conference Committee (YCC), and meet to prepare for the conference four times in the year. This year's YCC included co-chairs Kira Creatura and Dane Daniels, Deandrea Martin, Justin Silnutzer, Luca Trapasso, and Bobbi Hudson. Mr. L.B. Scott, SFAPAL executive director, announced a bit of a difference in this year's conference; it involved members of the current YCC and the AAC as instructors in the break-out sessions. "This change moves us closer to our goal of a truly youth- run conference." Leave it to the YCC and video whiz Austin Steele, a PAL alumni, to make rules and regulations sound like fun. At the start of the conference, PAL kids enjoyed watching a very funny video, starring the YCC acting in various roles, showing how to keep things flowing smoothly, minimize problems and ensure everyone's safety at the conference. 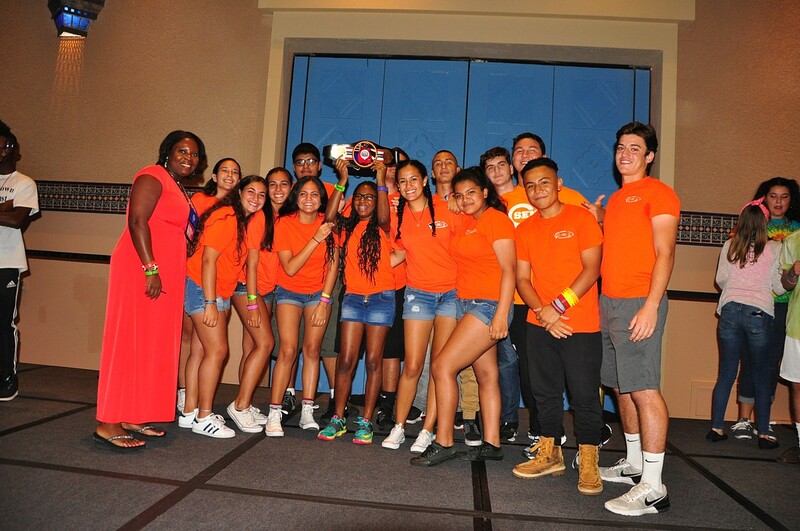 Coral Gables PAL take 2nd place during the 2nd Annual Lip Sync Battle! PAL alumni kids, no matter how old, continue to be important parts of the PAL family, and many of them are able to return and help with the annual conferences. Their experience is invaluable! This year, the alumni gave their group an official title: the Alumni Advisory Committee, or the AAC, for short. Thank you to Jeffie Clark, Austin Steele, Aakash Bakshi, Liza Creatura, Jerae Parrish, Zeke Hayes, Kevin Stinson, Kali Alexander, and Max Trapasso. The Disney movie, Inside Out, inspired the theme for this year's conference. Inside Out "plants its viewers right inside the mind of an eleven-year-old girl, Riley, one [who is] only first learning about the inevitable sadness that comes with growing up," Reviewer Michael Arbeiter wrote for Entertainment in June of 2015. "As we join young Riley in discovering new anxieties, apprehensions, and doubts, we're ushered back into our own pilgrimage into the emotional calamity of teenhood and beyond." 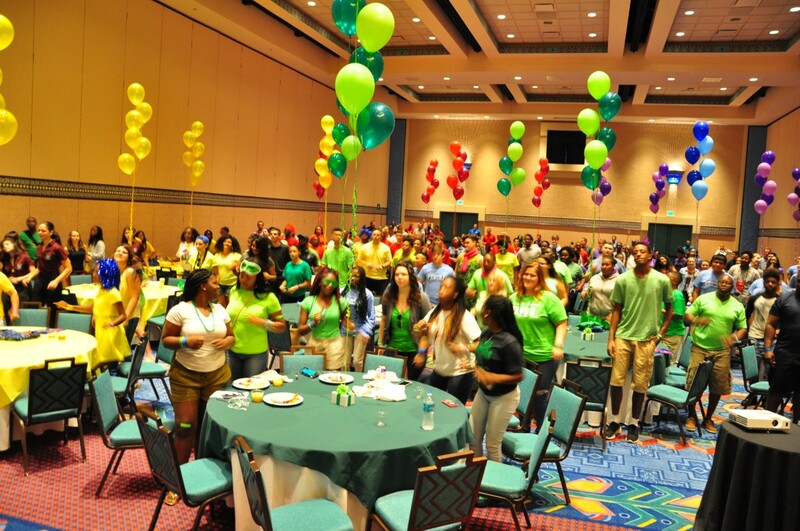 The youth at the conference were led and encouraged to deal with the complex mix of emotions we share in common, like joy, fear, anger, disgust and Dozens of blue, red, green, yellow and purple balloons, representing those emotions, hovered over the tables in the conference room. But First, the Lip Sync Battles: A Time to Get Wild and Crazy, in an Orderly Way, of Course. 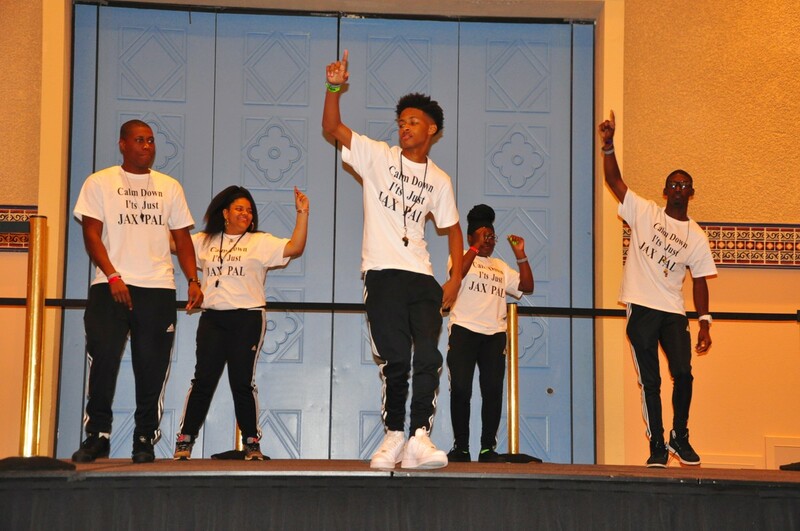 The conference opened on Thursday night with PAL kids competing in high-energy dance moves to their favorite pop music-based on the popular Spike Network's L.L. Cool and Chrissy Teighen's Lip Sync Battle. D.J. Ready Freddy and M.C. Avery Randolph, Ormond Beach PAL, kept the fast-paced momentum building for the PAL competitors. Costuming, imaginative choreography, bubbles wafting into the audience, cool tunes-all were part of the fun. One by one, the PAL teams got their chance, beginning with the Alumni Advisory Committee (AAC) and the Youth Conference Committee (YCC). More than a dozen PAL groups followed, with much enthusiasm, both on and off stage. Music ranged from "It's a Party in the USA" to "Ice, Ice Baby." Jacksonville PAL shows why they have held onto the title of 'FL PAL Lip Sync Battle Champions' 2 years in a row! After this rollicking dance party, a panel of four judges, with the help of applause and cheering from the audience, selected the winners. 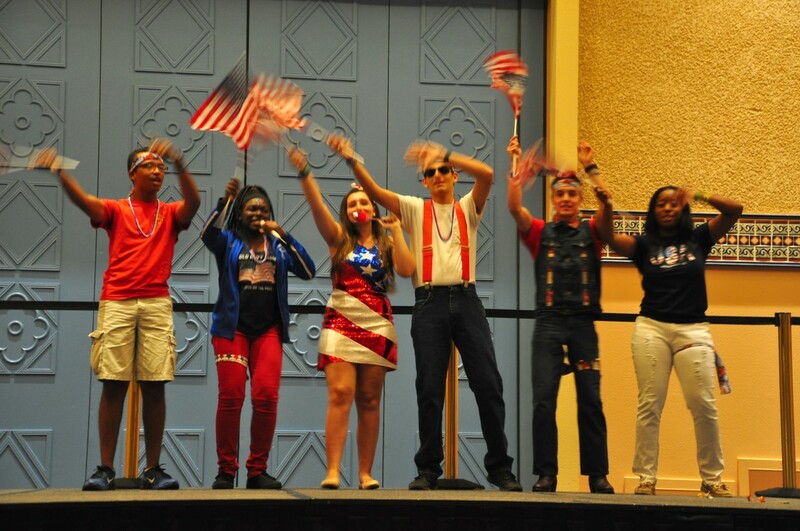 Avery Randolph, MC, called for a drum roll (which the PAL audience cheerfully provided by drumming on the tables) and announced the champs of the 2016 Lip Sync Battle: JAX PAL took first place, for the second year in a row; Coral Gables Pal, second place, and West Melbourne PAL, third place. Thank you to Fort Pierce PAL and Paul Pearson for donating the boxing belt prizes presented to the winners. The Youth Conference Committee, after months of planning, mapped out five workshops for the conference: Self-defense, Domestic Violence and Teen Dating Violence, Diversity, Becoming a More Resilient Person, and Life after High School. The session on Self-defense, was led by Vincent Taylor, well known for his Reading, Rappin' and Having Fun workshops, and his Cornbread book series. Less well known is that Mr. Taylor was a PAL kid! "I found my confidence in martial arts at PAL at age twelve and thirteen," he said. That confidence has inspired him in adulthood to create materials and services which help others. Simply put, he said, "I wanted to give students the same feeling for reading I had." 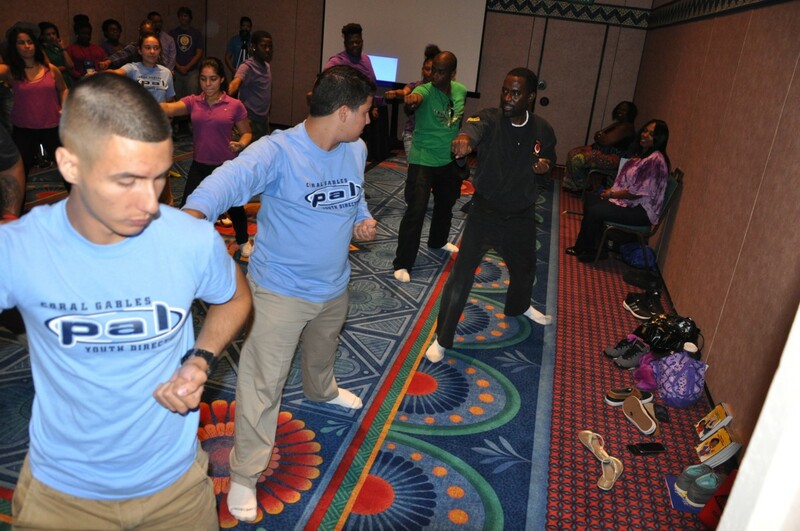 And he also wants to give PAL kids the confidence of knowing how to protect themselves in dangerous situations; thus, this martial arts/self-defense session offered at this year's PAL conference. The Self Defense Session instructed by former PAL kid, Vincent Taylor!!! Mr. Taylor led the PAL kids in each session through a series of karate moves they could use to protect themselves if they are threatened. What if someone grabs you by the wrist? Or the throat? The kids now know how to respond. Kiai! Take that! Mr. Taylor urged the kids to use the buddy system, be aware of their surroundings and take a different route if necessary, make eye-contact with strangers (that will indicate to a potential attacker that you could ID them later), minimize distraction of devices like phones, look behind you, don't leave your drink unattended at a party, and know where the exit is. The session on Domestic Violence and Teen Dating Violence was led by Lt. Lakesha Burton, executive director of JAX PAL. The young people learned that domestic violence and teen dating violence look a lot alike. Statistics show that one out of four teens is being abused in a dating relationship, and 94% of abused females in these relationships are between 16 and 19. The abuse can be verbal, physical, sexual, and emotional. Lt. Burton showed a 48 Hours episode, Break-up Violence, when love turns to hate, which illustrated several actual cases of violence, and which made the point that the aftermath of a break-up is a volatile time, full of anger and emotion. People caught up in this turmoil need some other outlet besides anger in dealing with it. The abuser, the victim and the observer all suffer consequences, ranging from depression and anxiety, injury, risk of suicide, and low self-esteem. It is advisable for the observer to speak up, to share with someone who might make a difference in the unhealthy relationship of the abuser and victim. 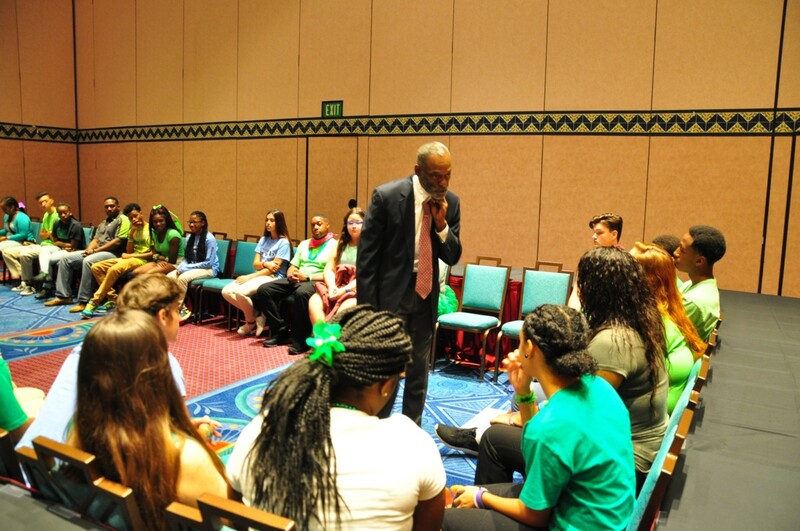 Dr. Ed Hayes 'Diversity' session was a huge hit with all participants. The session on Diversity was led by Ed Hayes. He has found success in far-ranging fields, ranging from his days playing college football and later playing for professional teams to being a successful Jacksonville, Florida businessman and becoming an ordained minister. But success in life is not all about money, he always tells the PAL kids. It's about helping others. It's about being excited about life. It's about being excited about learning and education. In this session he encouraged the kids to examine their perceptions and misperceptions about others they meet. When he asked what diversity looks like to the kids, they responded: gender, age, personality, style, size, education, money or the lack of it, food, religion, beliefs, IQ, physical challenges, language, health, goals, ethnicity, abilities/talents, socialization, history, and culture. "Diversity is like a rainbow, or a salad," he told the kids. "Though we're different, we're the same. We judge people just by looking at them. Prejudice is pre-judging. We are all prejudiced. You don't get a second chance to make a first impression." Each participant was to find someone in the session and say to them, "I love you and there's nothing you can do about it." The session on Becoming a More Resilient Person was led by PAL alumnus Max Trapasso and his brother, Luca Trapasso. Max currently attends UCF and works at Universal Orlando, and Luca is a high school senior, is in ROTC and is involved in his local PAL. No one can avoid stress, Max and Luca said, but we can learn how to manage it, and as facilitators of this session, they laid out a plan, which included relaxation techniques, measured breathing, meditation, exercise, which releases stress, and imagining yourself in your "happy place." Find constructive ways to communicate with others to resolve stressful situations, like face to face meetings in which participants can express frustrations and discuss issues. Allocate time to do things you love, like enjoying music, drawing, or working out; you will feel refreshed and you will get back to doing your job more efficiently. Max and Luca like to play the steel drums! The Life after High School session was led by Chief Mel Williams, Cheryl Lawson-Young, and Sergeant Paul Creatura. Chief Williams is the director of public safety at Bethune-Cookman University and also teaches as an adjunct professor of criminal justice there. Cheryl Lawson- Young is presently serving as compliance and prevention manager at Bethune-Cookman University. Sergeant Creatura has served with the Satellite Beach Police Department since 1992, and helped found and is still actively involved in the Satellite Beach PAL. A panel of young adults, mostly former PAL kids, shared their experiences, the good and the bad, of getting out into the world after high school. Each one has found their passion in their occupations. The panel: Nicholas Abrahams is now serving as governmental affairs manager for the St. Johns River Water Management District in Orlando; Patrick Abrahams (Nicholas's brother) is a talent producer for ESPN; Jeffie Clark owns a trucking/transport business, Quality Transport Services; Kali Murray is an exceptional education teacher; Liza Creatura is a communications major in her junior year at UCF; and Katherine Lagow, the only panel member not a former PAL kid, works at ESPN. At the beginning of the session, each PAL kid in the room told what he/she wanted to do as an occupation, which included such notable aspirations as being a heart surgeon, a general, and a veterinarian. Then the panel shared their stories, beginning with Nicholas Abrahams. "Ten years ago, I was in your place," he said. "Write all this stuff down that you hear." Nicholas thought he wanted to be in a sports' related field, but after he took a position as an intern in state government, he found out that suited him far better. "When you find what you love doing, and it's your job, you'll never work a day in your life." "I had an obsession; I had to be the cool kid," Patrick Abrahams said. "When I was in your chair, fifteen-sixteen years ago, I heard Ed, Big Milt, and [all the speakers at the PAL youth conferences], but I didn't listen. I didn't prepare for college. My mom didn't have money, so I worked and went to the University of North Florida. All I had to do was not be a jackass. But two weeks into school, I was with my buddy, and he's trying to sell weed. I was still trying to be cool. [And they were caught] But PAL is family who work together to help, and Officer Paul and Lori [his wife] brought me back home. They were there for me, even though I was the loser- from cool, to the loser." Things began to get better for Patrick, and in time, he graduated from the University of Central Florida. He counseled the PAL kids: "My mom taught me the three "C's:" choices, control, and consequences. You have the control; you can make the wrong choices, but be prepared for the consequences. McKenzie Zukowski, SFAPAL Girl of the Year!! "You don't need to know where you're going; just know who you're with. Don't hang out with someone who has less to lose than you do. And dress for where you're going, not for where you've been. I was a runner at USPN, making $15 an hour. Nick [his brother] came to work there, dressed like a nerd [i.e, dressed very nicely], and they didn't want me with my backward's baseball cap. I had to learn this lesson about how to dress from my younger brother. Soon, I became the best runner at USPN. No job was too menial, and I did it all with great enthusiasm." People noticed, and Patrick began to move up. "Life is about hard work. Whatever you do, be the absolute best, and life will pay itself forward for you." Jeffie Clark started in PAL's after-school program in 2008. "It was my mother's idea, but it was the best thing that could have happened to me." He participated fully, and later was part of the Youth Advisory Council and the Youth Conference Committee. "When I finished high school, I was offered a job at the Miller/Coors distribution center, but I didn't like that job. I did like driving a truck though, and so I went to a truck driver's school and got a license." Jeffie still remembers to the penny what that course cost him, and it was more than $6900. From there, he leased his own truck, and has his own company, Quality Transport Services. "It's great," he said. "I love every day of it. I'm all over the country in a semi, and I want more trucks." Chief Mel Williams said, "Jeffie's story shows that college is not for everyone, but education is. Jeffie had to go through a training program to be qualified [in order to follow his dream]. Kali [Alexander] Murray, is married, and is a twenty-three year old special education teacher in Orlando. She came to be part of the panel at this session to share with the PAL kids how she found the focus for her life during a PAL event. "I wanted to be different things at different stages of my life," she told the PAL kids. But mainly, she wanted to be a veterinarian. However, she didn't like her science classes, and there would be a lot of them if she continued on the path to be a vet. She opted to leave the International Baccalaureate Program in her high school so she could pursue dual enrollment, and that worked out better for her. Another good turning point was in the summer of her junior year, when she had the opportunity to work at a special needs camp one summer, and she loved it. "But I still had that internal battle about what I wanted to do." Florida PAL is especially Thankful and Grateful to our partnership with Tomorrow's Team, who presented (4) four ($1000.00) One Thousand Dollar scholarships and One (1) Five Hundred Dollar scholarships to deserving FL PAL kids. THANK YOU Tomorrow's Team, Nicolas, Patrick, and Courtney Abrahams and Sgt Paul Creatura. Then, at a SFAPAL Youth Conference Committee (YCC) meeting, one of the facilitators, Shaun Derik, asked the YCC members to be as specific as they could about what they wanted to be. "I didn't know what to say until he asked, but when my turn came, I said right out, 'I want to be a special education teacher.' " That clinched it. "I finished my AA degree before I graduated from high school. I had a dream; I didn't want to pay for college, so I applied for scholarships and went through two more years of college debt-free." Kali made good choices, and enjoys teaching. "It warms my heart," she said. "The children I teach are so unique; they have amazing personalities. I love going to school each day to work with them." "Kali is an example of what each of you can do, too," Chief Williams said. You might say that Liza Creatura has always in PAL, since her father, Sergeant Paul Creatura, was very involved in the program, and often brought Liza along with him. "From the time I was five years old I grew up in PAL, and then when I was eleven, I got involved in the Youth Directors Council. I am now a junior at the University of Central Florida majoring in communications. My major has changed a few times. After high school, I didn't make too many plans. I did some college during high school through dual enrollment. Don't let people look down on you if you go to junior college. You need general classes the first couple of years wherever you go to school, and you can save money at a junior college." Another good thing: Liza started junior college with no loans. Panelist Katherine Lagow, though not a PAL kid herself, knows about PAL through Nicholas and Patrick. "They had moments in PAL that were life-changing. You know the kids who are not here now? They are not successful; they didn't invest in themselves." "I thought I had a plan as a young child; life was all mapped out at age eight," Katherine said. "I worked hard at sports so I could get scholarships. I had goals, but my father said he couldn't afford the kind of education I wanted. I did get scholarship offers, and I chose to go to Louisiana State University to play soccer. But I got hurt, and I realized I couldn't do sports forever, and I needed a different plan. At first, I had been in pre-med, but it was hard to keep up with the classes and the sports, so I switched to political science and history. I loved political science, and I decided to go to law school at LSU." Katherine found law to be very "self- focused," and she missed the teamwork she always thrived on in sports. She persevered, got her master's, and passed the bar. The Life After High School session received the most rave reviews and sparked a great discussion on making the best choices for your future. "But I wasn't enjoying myself, so I walked away from it, started at ESPN at the very bottom, and that is the happiest I've ever been. I love what I do! If you're going to take chances in life, do it while you're young. It's okay to change your mind and do what you want to do. If you love it, you don't ever work." Sergeant Paul Creatura, who has been a major player in the lives of many PAL kids, often standing in as a father figure when none is present in the family, said, "Five years from now, call us; we'll help you. We're family. You have to do the work, but I'd bet on each one of you. I told Nick [Nicholas Abrahams], 'Surround yourself with good people,' and he did. He found a wonderful wife. And Jeffie [Clarke], who is twenty-one, now drives a four million dollar truck around the country. Liza is on her way to graduation. Katherine was not part of PAL, but now she is. Every person on this panel took their time to come here to speak to you. We want you all to do well-whatever you do. Do what you love and be happy. Sometimes we fail; but when you fail, you're judged by how you get back up." On Friday, July 1, 2016, the Honorable James A. Ruth was featured as the keynote speaker at the conference. Judge Ruth has worked as a counselor for the Florida Department of Corrections, as a juvenile counselor for the Florida Department of Juvenile Justice, six years as a prosecutor with the Office of the State Attorney, and more than twenty years on the trial court bench. In the midst of those positions, he served our country for more than thirty-three years in the Army Reserve, in many different posts and capacities in this country and abroad, including supporting Iraqi Freedom. In 1992, James Ruth made Jacksonville history when he became the first African-American to win a circuit-wide election. Judge Ruth has run unopposed since that time. James Ruth is no stranger to PAL: He was a former JAX PAL kid who remembered Mr. L.B. Scott when Mr. Scott was directing JAX PAL. In the course of time, Mr. Ruth's daughter became a PAL kid, too. This son of public school teachers had a message for today's PAL kids. He crushed some myths people believe about the court system, and he shared three keys to success in life. He made sure the kids would remember what he had to tell them by offering money to those who could answer questions correctly-always a good motivator. Two boys each won $60.00 for good answers: Dion Villiers and Tariq Sanders. Judge Ruth related several actual scenarios involving youngsters, crimes committed, and the consequences in each instance. The Judge advised the kids to watch who they hang out with. You might just be along for the ride, he said, but if there is a crime, you will suffer the consequences, too. Judge Ruth offered this advice in order to succeed: (1) Believe in yourself, (2) Set goals, (3) Keep academics first, and work hard. Kira Creatura introduced brothers Patrick and Nicholas Abrahams, who with Courtney, Nicholas's wife, founded their non-profit Tomorrow's Team in 2013. "They were inspired to give back to communities that helped shape their lives." Brothers Nicholas and Patrick Abrahams, both former PAL kids and now adults well into their respective careers, and believing that the leaders of tomorrow are created today, say that through Tomorrow's Team scholarships, they want to offer "outstanding opportunities for our youth in Florida." Mr. L.B. Scott said he watched these two young men grow up. Patrick was the first YDC member in Satellite Beach PAL seventeen years ago, and Nicholas was a YCC chairman and SFAPAL Boy of the Year. "They were the first ever to come back and make a contribution like this for PAL," he said. "About ten years ago," Nicholas said, "I was on stage here and asked Dr. Hayes to come up and lead a PMA," and he asked Dr. Hayes to join him on the stage at the current time. (You can't talk about Ed Hayes without also talking about the theme he emphasizes: positive mental attitude, or "PMA," for short. He is known for leading the kids through chants of "Give me a P," "Give me an M," "Give me an A!") Dr. Hayes obliged on stage by leading a rousing "PMA" chant. "You are now an official member of Tomorrow's Team," Nicholas told Dr. Hayes. The following PAL kids received scholarships from Tomorrow's Team at the State of Florida Association of Police Athletic/Activities Leagues annual Youth Directors' Conference, held June 30 through July 3, 2016 at Disney's Coronado Springs Conference Center in Lake Buena Vista, Florida. Becoming a More Resilient Person" session was conducted by SFAPAL's own YCC Member Luca Trapasso (a junior in High School) and Max Trappasso (a college Freshman) an AAC Member and former Chairman of the YCC. Cameron Walden, Ormond Beach PAL, $1000. Deandrea Martin, Cocoa PAL, $1000. Jose Amadeo, Coral Gables PAL, $1000. Sherrod Horne, Brevard County Sheriff's Office PAL, $1000. And a surprise fifth recipient, later announced during one of the conference's break-out sessions: Javan Truttling, Cocoa PAL, $500. Mr. L.B. Scott, executive director of SFAPAL, announced that Cameron Walden, from Ormond Beach PAL, will be the 2016 SFAPAL Boy of the Year. The award is named for Julian Jackson, an invaluable PAL supporter who over the years donated more than a million dollars to PAL. Mr. Scott announced that McKenzie Zukowski, from West Melbourne PAL, will be the 2016 SFAPAL Girl of the Year. This award is named for Sherry Truex, who was a devoted and esteemed PAL director. Both award recipients received a laptop, with software and a backpack, compliments of Mr. Chris Robinson, SFAPAL grant manager, and Sergeant Paul Creatura, a founder and dedicated leader in Satellite Beach PAL. At the December 2016 SFAPAL Member Training Meeting, each recipient will receive a check from SFAPAL for $1000. 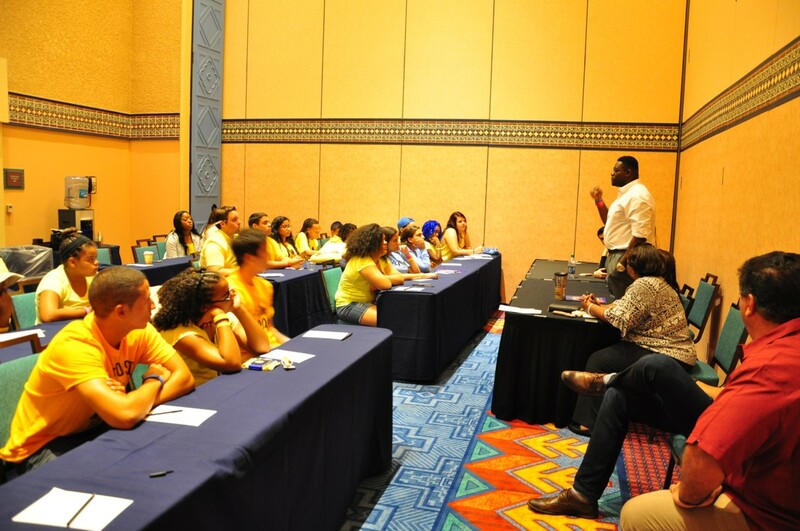 Council (YAC), the Youth Conference Committee (YCC) and a Youth Director's Conference co- chair during his seven-eight years in PAL. He is a PAL alumnus now. Max said he had unforgettable memories of these PAL conferences: "The training, the speakers, the classes - the information sticks with me," he said. "The learning experiences help in life, and have given me the opportunity to succeed and grow in life. Pat and Nick [Abrahams] giving back [through Tomorrow's Team scholarships] has inspired me to give back, too. So this Fall, I will offer a $500 scholarship to one outstanding applicant from the YAC or YCC. It will be awarded during the winter luncheon in December [during the SFAPAL Members Training]." At the final closing session of the conference, anyone of the PAL family who wished to speak was invited to talk briefly about a memory associated with PAL, and which might be identified with one of the emotions examined during the conference. As the microphone was passed, more and more kids and adults stood up to speak; it sparked an enthusiastic flow only stopped much later because of time restraints. Liza Creatura said she will cherish the memory of Rhonda Scott (SFAPAL program coordinator) presenting her with a gavel for serving as YCC chair. "Rhonda is like a second mother to me," Liza said. Zeke Hayes, from Lake Wales PAL, and part of the PAL Alumni Advisory Council (AAC), told of a fond memory from two years ago when all Youth Conference Committee (YCC) members gave a speech. "We all supported each other, and backed each other up," he said. Max Trapasso, who has been in PAL seven or eight years, said a fond memory he has was during a Youth Conference Committee (YCC) training meeting when the group began to look for a place to eat a late supper at Downtown Disney. The place they chose took "forever" to serve them, and the kids finally opted to make their dinners take-outs. And the food was too expensive for the small amounts they served. Jeffie Clark said the impact of this program (PAL) on him has been a great journey. "Last night, I was telling some guys, 'It's possible for you to be up here (like being on the YAC or YCC).' I was proud of being part of the YAC, YCC and now the AAC. I love all you guys from the bottom of my heart." Austin Steele, the "video guy," started with PAL in 2011, and this is his last year. Describing himself as a pretty shy person, he has found a comfortable place and lots of acceptance in PAL. Cameron Walden, SFAPAL Boy of the Year. Jerae said she was the oldest of the Alumni Advisory Council, and the shortest. A fantastic, fond memory she told about was when National PAL invited PAL kids from around the country to be part of a group to tour the nation's capitol and meet with senators. "There is so much you can learn and take from [PAL], and that is why I'm still here." Sahara mentioned the Life after High School break-out session at the conference this year, when the older kids came back to share, how they came from different backgrounds, and succeeded. She was inspired by their stories and it made her feel really good. Lori Creatura, from Satellite Beach, who mainly serves PAL as an adult advisor, never planned to be up speaking like this in the fifteen years she's been working with the kids. She spoke of her pride in Nicholas and Patrick Abrahams, and PAL's impact on her daughters. A girl, whose name I couldn't catch, said the Dating and Domestic Violence session at the conference taught her she could, and should, speak up when she sees abuse. Dion Villiers said he liked Dr. Ed Hayes' session on Diversity. He enjoyed the humorous ways Dr. Hayes conveys his message. AJ, from Coral Gables PAL, said his favorite memories of PAL happen on the PAL bus. Even though there's no A/C, and there's way too much country music, he said he loves it because of the people on it. "It's a big family," he said. "We're always going to be a family even though it's my last bus ride on there." A PAL kid, whose name I didn't hear, said, "At a meeting in Melbourne earlier this year, I was in danger of getting into trouble, though I was innocent. Miss Linda told me that people can bring you down even if you love them. "You might have to love them from a distance, but don't let them bring you down." A young PAL man advised, "Always make curfew," as he had a hard time one night at conference this weekend. The group he was with wanted a late meal, but they knew it was getting late. He bolted through bushes and all, he said, hurrying to get back to the hotel room. "I was scared for my life." To the amusement of those present, Delores McLaughlin, his PAL director, said that though the young man didn't know it, someone in his group had already texted her, letting her know they were on their way. A PAL boy said Dr. Hayes always says, "Hey Boo," whenever he sees him. "I like that,"
A PAL teen liked how Cameron Walden had just received recognition at the conference, and also liked how Tomorrow's Team, in addition to the four scholarships announced earlier, gave an extra surprise scholarship to Javon Truttling, a PAL teen from Cocoa, during the Life after High School break-out session. "People in PAL can really make a difference in life. That showed me," he said. Jake Wenner, a Satellite Beach PAL teen for the last four and a half years, said PAL has taught him a lot about himself, and has taught him about interacting with people. When he joined, he just wanted to try PAL, he told himself. "I wouldn't have stood up like this," he said. "PAL has meant more to me than anyone could imagine. Miss Rene [Satellite Beach PAL Director Rene Ingram] and Mr. Paul [Sergeant Paul Creatura [Satellite Beach PAL leader]--it all means the world to me." "What's it all about?" another young man spoke up. "It's about meeting new people, making connections, nothing to worry about." Another PAL kid "loves all the energy, being all together." Several boys spoke about someone who means a lot to them: Jeffie Clark, a PAL alumnus. "We look up to him like an older brother," one said. "Jeffie took me in, took me places. He's taught me respect, leadership, always encourages me and tells me not to give up." Another of Jeffie's admirers said, "He's been there for me." Belinda Legut, Ormond Beach PAL director, said she has been doing "this," meaning her work with PAL, for thirteen years, and she has wonderful memories of the many people she's met. There've been trials, tough times and tough kids, but she would miss each and every one and would want to be back. She thanked Lori and Paul Creatura: "They are God-sends to quite a few kids, and Cam [Cameron Walden, Ormond Beach PAL, received SFAPAL Boy of the Year award during this conference] is just one in a million they've helped. And I can't say how much Florida PAL has done for these kids. I love each and every one of you." 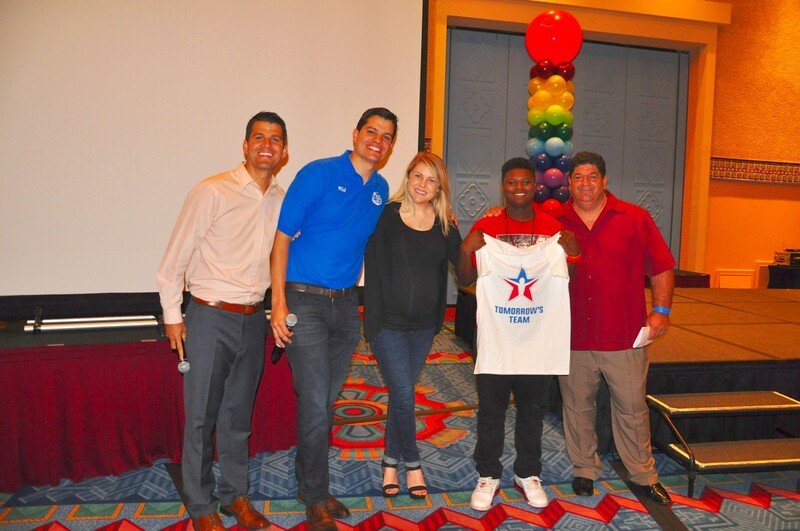 Javan Truttling, from Cocoa PAL, who received a $500 surprise scholarship from Tomorrow's Team during a break-out session at the conference, said, "Yesterday, [receiving the scholarship] means a lot to me. I want to say thank you to PAL for being everything to me. I really need that scholarship money." Amy's favorite memory was from Friday night at the Tower of Terror, even though she is terrified of heights. However, she loves roller coasters. "I screamed, 'I'm going to kill you,' the entire time, but it was really fun. I went again, and there were fireworks. It was amazing." Bryce, from West Melbourne PAL, said Mr. Ed Hayes wanted to smash his friend, Dion, like a peanut butter sandwich, and they thought that was pretty funny. Carlos, from Coral Gables PAL, thanked Flo [Coral Gables PAL Director Jose Flores]. "Love all you guys; thank you." A PAL teen said on going to the Park, the friends had forgotten their passes, so this speaker went with Bobbi [Hudson] and had a great time. Delores McLaughlin, Cocoa PAL director, said, "The one reason I'm still working with PAL is this State PAL conference and the Youth Directors' Program. It's great to connect with kids from all over the state. State PAL has been good to Cocoa PAL. I don't care about sports, but PAL is so much more, like the leadership program. Young folks, please take advantage of that. You need to be flexible, adapt and comply. If you can't do those things, you're stuck." Jordon, from Ormond Beach PAL, said, "PAL is like a second family to me. I love you all; one day I want to look back and say, 'You made me who I am." Corinna, from Lakeland PAL, said she hasn't been in PAL that long, and actually hated it at first, didn't appreciate it. Then she started to see "the good-and here [at the conference] especially, after going to the Life after High School breakout session, I was inspired to hear Pat [Patrick Abrahams] talk about his missteps and what he's doing now. That inspires me. Just hearing him, helped me. I wish I had joined PAL earlier; I'm a senior now. The PAL offers a lot and I want to say thank you. I really appreciate PAL." Another spoke of a cutting-it-close-to-curfew experience, when the group he was with wanted a late night meal, and decided to go back to their hotel room and order pizza. But they kept getting off on the wrong floor, trying to find their advisor's room. And then this speaker almost dropped the pizza. 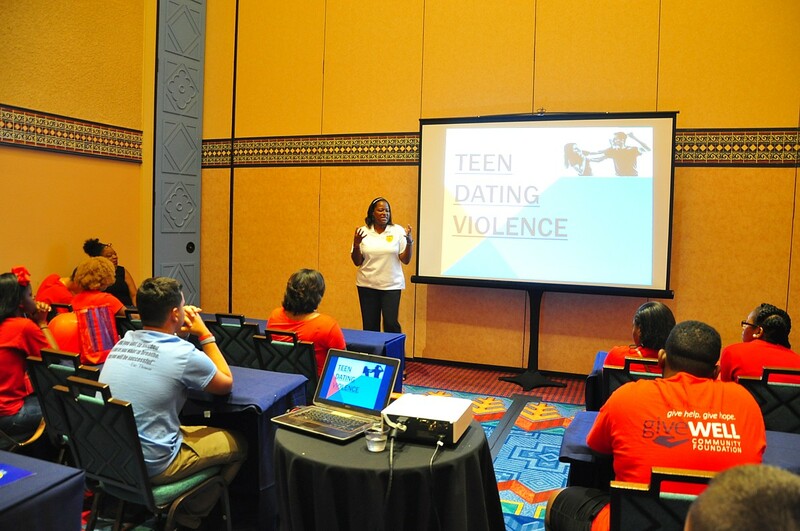 Lt. Lakesha Burton, executive director of JAX PAL instructed a captive audience during her session on Domestic Violence and Teen Dating Violence. A PAL girl said this weekend has been really good. She thanked Lt. Lakesha Burton, Jacksonville PAL director and leader of the Domestic and Dating Violence breakout session at the conference. "She understood my situation, and told me I could come to her for anything." Arianna, from West Melbourne PAL, said when she first started PAL, she wasn't sure she wanted to do this. She had no friends in PAL, and there were some girls there she didn't like. But now, she said, "We get along great. I appreciate everything PAL has done for me in my Sabrina, said last year was her first Youth Directors' Conference, and she met Kira, and made lots of friends. "I felt like I had made new best friends, and I started bringing other people into PAL." Tre, said, "It all started with a haircut a messed up haircut. Then I lost my car keys the next day. Then I lost my wallet. Finally I found my wallet in my suitcase." This session could have continued for quite some time more, judging from the level and extent of participation. After hearing the kids reliving some of the many emotional experiences of the conference, Rhonda Scott, SFAPAL program coordinator, said, "It's been a lovely emotional journey this weekend." "When I wake up in the morning", Mr. L.B. Scott said, "and look in the mirror, I know I've done the best I can do for these young people. I don't want to ever retire." The Fear/Fearless and the Joy teams won for costumes and for architectural construction, using commonplace materials, and masterminding their projects in a short time frame during one of the group activities of the conference. 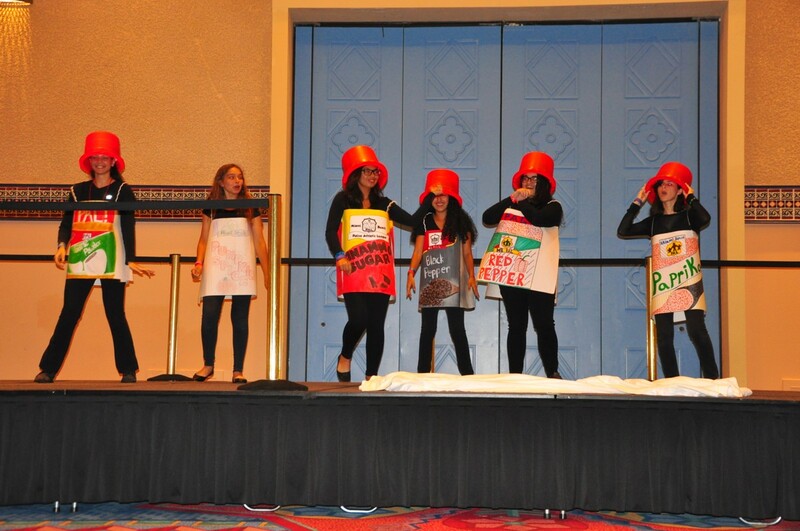 Winning for having the best costumes (on the Friday of the conference) depicting fear, anger, disgust, sadness, or joy, were Jacob, Sahara, and Kristy, from West Melbourne PAL, which will receive a $100 credit toward next year's Youth Directors' Conference. "We've been through all the emotions," Rhonda Scott said, thanking them for their participation. "Thank you all for coming," Mr. L. B. Scott, SFAPAL executive director, said at the closing. Every year I really worry about putting on a conference that's meaningful. I want you to remember some things you have heard here. That means a lot. We wanted you to mingle and interact and look up one day, some day, and see a familiar [PAL] face. We're a gang for Mr. Scott thanked Dane Daniels and Kira Creatura for chairing the Youth Conference Committee. "These young people do a lot of work in planning and choosing topics." He presented Kira with her second gavel, since this is her second year of co-chairing, and he presented Dane with his first gavel. "Job well done! And thank you, Youth Conference Committee for your magnificent work." "The Alumni Advisory Committee played a tremendous role in what we've been able to do at the conference," he said. I'm so proud of these young people. We need examples like them, giving back and getting involved. They give their time, their talent and their money. Yesterday, hearing Pat [Abrahams] talk, I was never so close to tears. You don't have to be Mr. Cool-a millionaire. You have to have a good heart. Kali [Alexander Murray], too-brilliant, intelligent, smart. We want you [PAL kids] to learn some things here that will make your lives Mr. Scott called Paul Creatura up front. "He's always trying to find a way to help someone-to make things better." "I do what I do because the good Lord told me I needed to do things to make other people's lives better," Mr. Scott said. Just seeing you here enhances my life. You may not realize it now, but at some point in your life you will, if you're open to the message and receive "SFAPAL board members, please stand," Mr. Scott asked. "My job is to run events, but I couldn't do it without the board's approval. And our staff, Rhonda-just one week ago she had surgery, and she's been here this weekend, making sure things run smoothly." Mr. Scott recognized and thanked wife Gwen, Juliya and Mark Moody, Chris Robinson, C.A. and Barbara Robertson, from California PAL, and all the speakers and session leaders. "Thank you, Judge James Ruth, for coming to share and support PAL, and for your generous $1000.00 gift for PAL." Mr. Scott closed the conference, asking in prayer for traveling mercies for everyone heading home.